Do Cows Have Poor Eyesight? Cattle see things very differently than humans do. Their eyes are located on the sides of their head, which gives them range of vision of more than 300 degrees. People have vision of about 180 degrees. Their larger field of vision gives them a much smaller blind spot -- they see all but directly behind them. They see depth and color differently than humans do, and they have a different sensitivity to light. When cattle have their heads down to graze, they can see almost 360 degrees. As they raise their heads, the sides of their bodies create a blind spot behind them. This panoramic vision allows them to see in all directions without moving their heads, but they have binocular vision only for an angle of about 25 to 50 degrees in front of them. Binocular vision is like ours: Both eyes focus on an object, allowing the perception of depth, speed and distance. Their monocular vision to the side allows them to see movement, but it is not sharply focused like human vision. Cows have slit-shaped pupils and weak eye muscles, which means they cannot focus quickly. They have poor depth perception because they have limited vertical vision of about 60 degrees, compared with around 140 degrees for humans. Because of this, they do not like to walk across shadows as they cannot tell if a shadow is a hole or ditch; they will stop moving forward and lower their heads to the ground to check it out. It was originally thought that cows were colorblind, but studies have shown they can distinguish colors and can distinguish on a gray background all colors except blue. They can distinguish colors with long wavelengths --these are red, orange and yellow -- much better than colors with shorter wavelengths such as green, blue, purple and gray, and this is thought to be a survival mechanism to allow them to see that blood was drawn if a member of the herd was attacked. Cattle react to light levels differently than people do; they tend to move from dimly lit to well-lighted areas if given the opportunity. They will avoid very bright artificial light indoors, so diffuse lighting is best if you keeping cattle under a roof. Well-lighted facilities are preferable when working with cattle to avoid ground shadows. 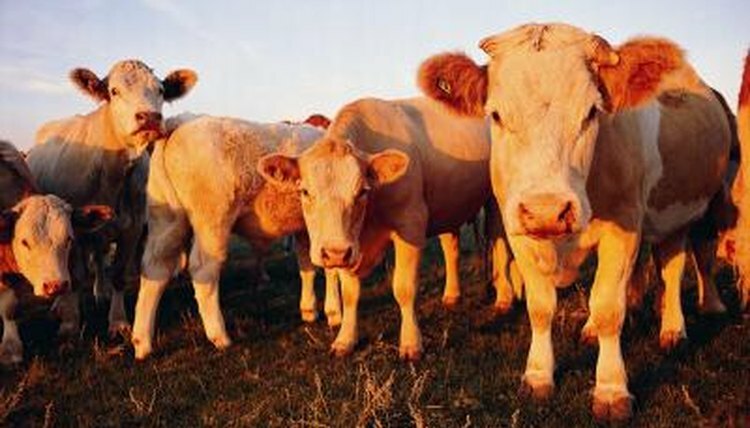 Use frosted lamps if you have to work cattle at night to reduce glare. Why Do Horses Used for Pulling Wagons Wear Blinders? What Do Flies See Out of Their Compound Eye? How Do Bees See Inside Their Hives? Do Guinea Pigs See in Color? Can Chipmunks See in the Dark? Can Rats See Color Just Like Us?